Although phosphorus (P) application is known to affect the zinc (Zn) nutrition of crops, the underlying mechanisms and effects of soil type are unclear. A greenhouse pot experiment was conducted with wheat, two soils (calcareous and acid), and nine P fertilizer rates (0, 50, 100, 200, 400, 1000, 2000, 3000, and 5000 mg P2O5 kg−1 soil). The effects of P application on the Zn content of shoots and roots in wheat and on the levels of available Zn in soil differed on the two soils. The wheat dry weight on both soils was highest with 2000 mg P2O5 kg−1. Total Zn accumulation was reduced above 2000 mg P2O5 kg−1 on the acid soil and above 100 mg P2O5 kg−1 on the calcareous soil. Available soil Zn declined when the Bray-P concentration reached about 34 mg kg−1 in the acid soil and when the Olsen-P concentration exceeded 200 mg kg−1 in the calcareous soil. 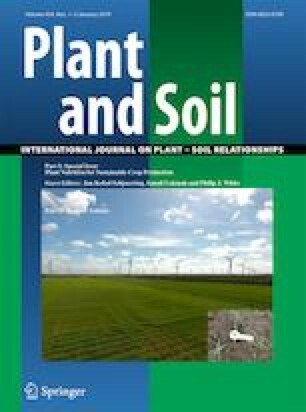 Shoot Zn concentrations were negatively related to available soil P on the two soils. The negative effects of increasing P application rates on Zn accumulation by wheat differed between the two soils. The effects showed no close relationship to available soil Zn. Xiu-Xiu Chen and Wei Zhang contributed equally to this work. The online version of this article ( https://doi.org/10.1007/s11104-018-3820-5) contains supplementary material, which is available to authorized users. The work was supported by the National Natural Science Foundation of China (31672240, 31272252), the 973 project (2015CB150402), and the innovative group grant of NSFC (31421092). We thank reviewers great contributions to the improvement of the manuscript and Dr. Bruce Jaffee from USA for reviewing and improving the English of the manuscript.